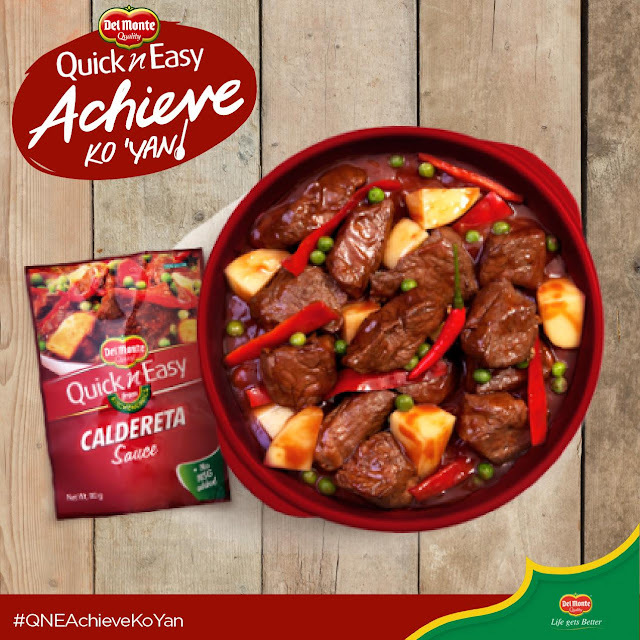 If you’re not used to being in the kitchen, you don't have to worry because cooking Caldereta is now quick and easy with Del Monte Quick ’N Easy Cadereta Sauce. Sure kang #QNEAchieveKoYan! 1. Fry potatoes in oil, turing all sides, until soft and slightly brown. 2. In the same pan, cook liver spread and beef, stirring occasionally until meat is brown. 3. Add 2 to 2-½ cups water. Cover and simmer over low heat or 1 hour until meat is tender. 4. Drain meat, reserve broth. Put the meat back to the pan and add only ¾ cup broth, add water if needed. 5. Add DEL MONTE Quick ’n Easy Caldereta Sauce, cheese, bell pepper and green peas. Add siling labuyo if desired. Cover and simmer for another 5 minutes. Stir fried potatoes. Serve.